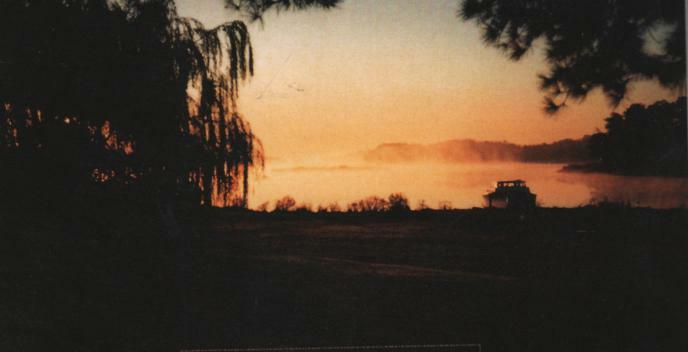 Early in the morning, the Chesapeake Bay has always belonged to the watermen. Once a waterman always a waterman. Watermen are close knit. Many started in the trade at a young age, and they are often following the traditional vocation of their forefathers. True watermen know the waters of the Chesapeake as they do their own homes. Most old-timers would say modem technology – depth-finders, Global Positioning System, and such – makes life easier, but unless you can do the job without them, you’ll never be a true Chesapeake Bay waterman. Kent Narrows, once a hub of the local seafood packing economy, the market where the watermen sold their daily catch, has also always been a hotspot of hospitality. In 1735, a man named John Hart was granted a permit to run an ordinary near The Wading Place, but appears to have soon moved his inn up the Chester River to Kingstown. Records show Hart was followed by Thomas Elliot Hutchings, whose ordinary stayed in business from 1759-1763, and in 1814, John Wright acquired a license to open his tavern in the vicinity of present-day Kent Narrows. Early American life was hard and practical, but as the population expanded and the pursuit of leisure grew more acceptable, vice grew more problematic. As early as 1702, the Maryland General Assembly had passed an act that levied a stiff penalty against any tavern owner that permitted tippling, drunkenness, or gambling. For generations, Sunday alcohol could never legally be sold anywhere in the state. 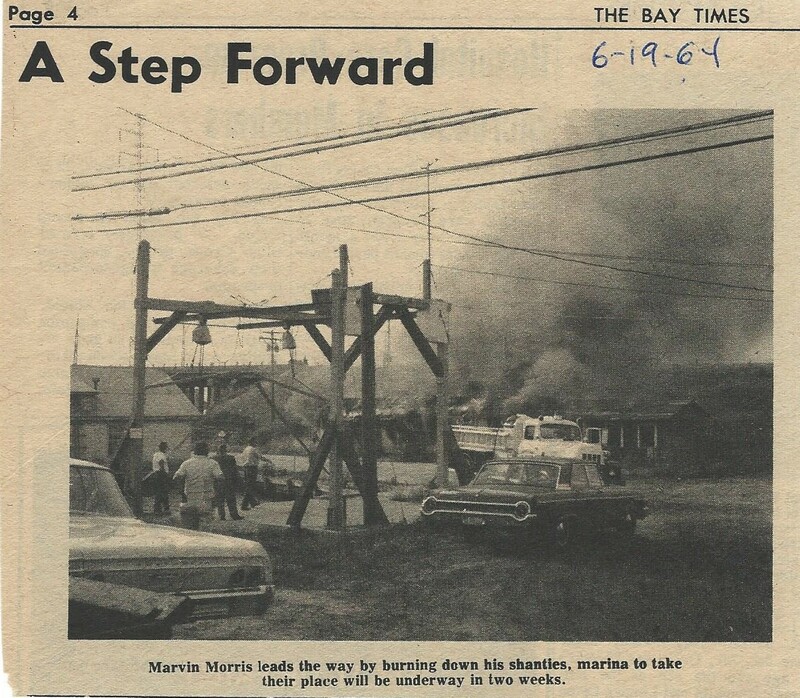 Around the time the present day drawbridge opened in 1952, bar owner William Beecher sold his little beer joint on the narrows’ southeastern side to local car salesman Marvin Morris for $8,000. Morris later picked up two adjacent waterfront parcels and carved out 60 boat slips that he rented primarily to watermen. Marvin Morris’s place, the Angler’s Club, became a popular local hangout. 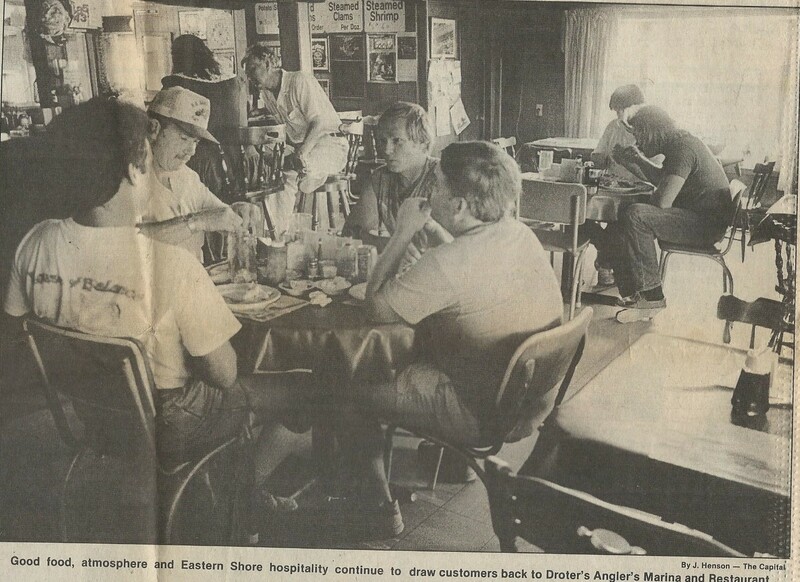 In a July, 1988 article written by Andrea Watters for The Sunday Capital newspaper, then-Queen Anne’s County Commissioner Wheeler Baker laughed when he remembered “Sunday School” at Anglers. Wheeler’s father, Queenstown beer distributor Albert Baker of RB Baker and Sons, among a number of local men in the know, would always volunteer to take the kids to church every Sunday…and then go wait for them at Marvin Morris’ bar. My sister reminded me of a story our dad used to tell about an incident at the Anglers Club from when he was running around in the 1950s or 60s. Dad’s buddy, let’s call him Dudley, had a nervous heart. One of the guys in dad’s group of watermen, let’s call him Wesley Walter, would always come in and eat off the bartender’s plate. Warned he’ll be shot if he takes the man’s food one more time, Wesley Walter can’t resist the very next time he walks in the place. Dudley‘s sitting at the bar. Wesley Walter grabs a French fry, or a half a sandwich or whatever from the bartender’s plate. The bartender pulls a shotgun from under the counter, aims it right at Wesley Walter and…somebody nearby, but off to the side, lights a firecracker. Dudley faints and falls off his bar stool. Bert and Cass Droter, frequent visitors to the Eastern Shore from York, Pennsylvania, bought Anglers in 1979 and ran it as a family business for almost thirty years. Though the Droters installed central air conditioning, expanded and converted the front porch to dining space, and removed the back room pool table to make space for even more food service, the pine and mahogany interior remained mostly unchanged, the authentic Eastern Shore roadhouse memorabilia multiplied, and everybody kept coming back for Miss Cass’s no-kidding home-cooking. An Anglers’ breakfast could be the highlight of your day. Their fried clams, their softcrab sandwiches, and their oyster stew were the best around. Everybody, traveler and local alike, usually felt at home at Anglers. “Seems like oystermen and the watermen and the western shore can mix in here,” Bert Droter told The Sunday Capital in 1988. 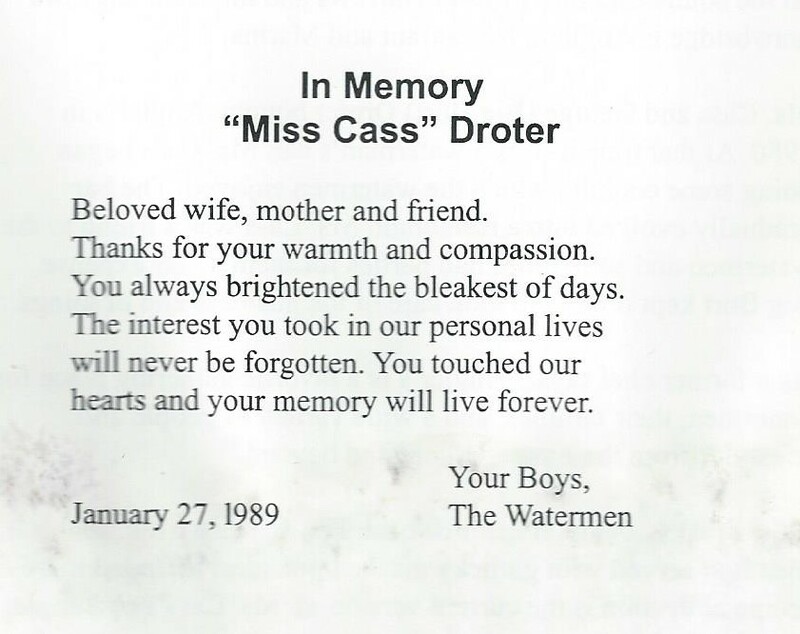 Cass Droter was a beloved den-mother to the tough, independent; sometimes grumpy, sometimes hilarious, sometimes both at the same time, watermen. Cass counseled them in rough times and celebrated life’s successes with them. Those who kept boats in the slips at Anglers could always rely on service that went above and beyond any money-making interests. It was more the way friends or family would treat people. 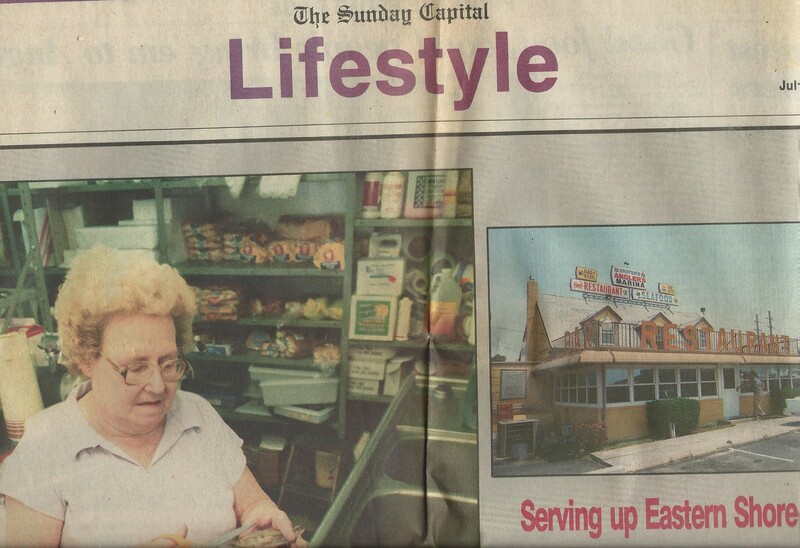 Cass passed away in 1989, not so long after The Sunday Capital article was published. 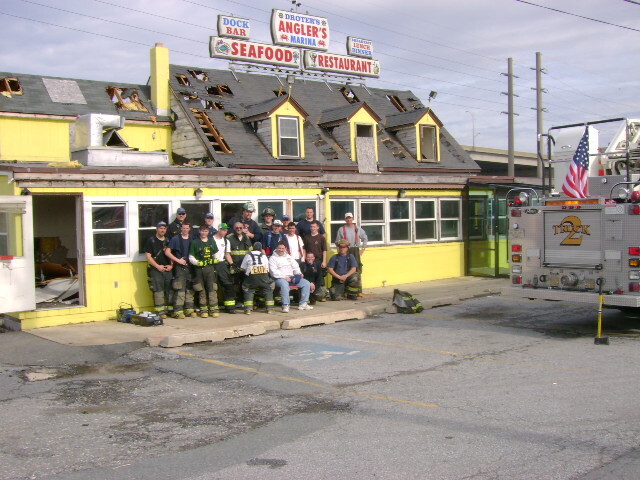 After a fire, the family closed the restaurant, and in 2007, area fire departments torched what was left of the old building in a controlled-burn training exercise. And another embodiment of uncountable memories bellowed into the sky with a farewell made of smoke and flame. I always loved going to Angler’s. You knew you’d get a good meal there, whether it be breakfast, lunch or dinner. Sad when it burned down. Yeah, I loved that place at 1:30 am. Thanks for commenting Dixie! I really enjoyed this Brent. Going to forward to Bev Baker if I still have her email. I know she would enjoy reading about her Mom and Dad. My Dad was a regular there. If we couldmy find him we always knew where to look. I grew up in a Watermans family, Grandfather, Fater and Brothers, learned crabbing as a child, that was my summer spending money. Miss the gruff, hard working tight knit community of a bygone era. Loved those days. What a great read (let’s be honest they all are)! I worked at both Angler’s and Harris’s for quite a while in my youth. Those were some of the best days of my life! All such great people. Jess – just saw this comment! Sorry it took me so, so long to reply! Thanks for enjoying my blog! Hope you’re still with me here! Jess! Sorry it took me so, so long to reply! Hope you’re still with me on here! Thanks for the story, Bill! That’s great. And I have a feeling I might know who Bruce was! That is hilarious, I believe I have a few more stories about that Bruce character! Angler’s Club is certainly missed by us all! Thanks for taking the time to comment, Dean! i worked in the kitchen making breakfast and lunch the sumer after I graduated high school. One of the sons (I forget which one) flew a plane, and was always trying to get me so agree to go one time. Never did, but looking back I wish that I had. One of my favorite jobs. the only part that sucked was cleaning and wrapping all the soft crabs every day after the lunch rush before I could go home. I’m talking DOZENS and DOZENS every day. I would love to get a look at that special recipe “notebook” the one lady I worked with had, but that was a closely guarded secret – wonder whatever happened to it? Great memories, Michele! Thanks for taking the time to share!